The Federal Trade Commission made final amendments to the Used Car Rule (formally known as the Used Motor Vehicle Trade Regulation Rule). The changes require car dealers to display a window sticker, or “Buyers Guide,” on used cars offered for sale. The Guide discloses whether the dealer is offering to sell a used car “as is” (without a warranty), or with a warranty. If the sale is with a warranty, the Guide discloses the terms and conditions, including the duration of coverage, the percentage of total repair costs the dealer will pay, and the vehicle systems coverage. 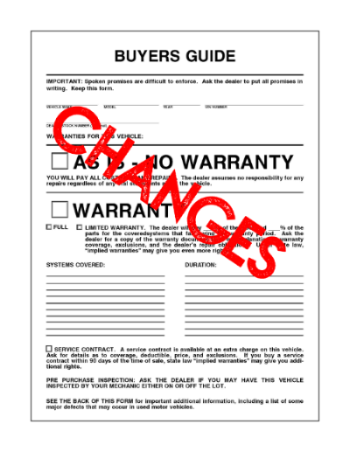 In states that do not permit “as is” used car sales, dealers must use an alternative Guide that discloses whether the sale is with a warranty or with implied warranties only. The Federal Trade Commission sought public comments in 2012 on proposed changes to the Buyers Guide and later invited comments on alternative approaches for the vehicle history disclosure and the “As Is” statement. -Providing a box that dealers can check to indicate that an unexpired manufacturer’s warranty applies. -Adding air bags and catalytic converters to the Buyers Guide’s list of major defects that may occur in used vehicles. -Visit safercar.gov to check for open safety recalls. -Providing a Spanish translation of the statement that dealers may use to obtain a consumer’s acknowledgement of receipt of the Buyers Guide. The amended Rule permits dealers to use their remaining stock of Buyers Guides for one year after the effective date of the amended Rule. The Commission vote to publish the Notice of Final Rule in the Federal Register was 3-0. The Federal Trade Commission works to promote competition, and protect and educate consumers. You can learn more about consumer topics and file a consumer complaint online or by calling 1-877-FTC-HELP (382-4357).